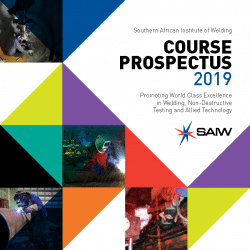 The Southern African Institute of Welding (SAIW) is the leading national resource for training and technical support in welding and non-destructive testing. 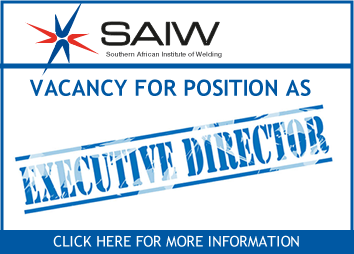 The Institute is seeking to recruit an individual for the position of Executive Director who is capable of maintaining the Institute’s national and international standing and further developing the Institute’s presence and capabilities in national provinces as well as throughout the African continent. Sound knowledge of the policies, legislation and practices that govern the operation of the Institute. Candidates must be mature persons from a technical background with a record of professional integrity, experience of leadership and people management skills. Applications should be submitted to Dimitra Kreouzi by email to dimitra.kreouzi@saiw.co.za by no later than Friday 3rd May 2019. All persons of interest will be contacted within a period of 15 days of closing date. Other candidates are thanked for their interest but should consider their application as unsuccessful. 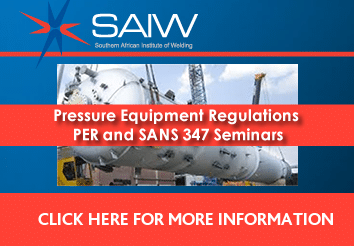 52 Western Boulevard, off Main Reef Road, City West, Johannesburg, 2092.